With this product you can accumulate up to 33 Glitter Points. Reduces the appearance of wrinkles and fine lines;Increases skin firmness;Restores the skin of the face;Decreases the intensity of brown spots. 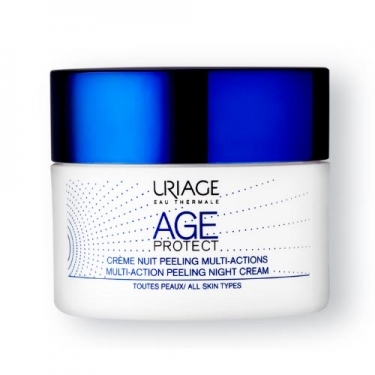 Age Protect Crème Nuit Peeling Multi-Actions from Uriage is a rich and silky cream that acts at night for a peeling effect revealing the luminosity of the skin. Night after night, its refreshing action smooths wrinkles, brightens the complexion, sharpens the grain of the skin and corrects the irregularities of the skin.